Please visit our new blog at www.smithfamilyresources.wordpress.com and our online store at www.smithfamilyresources.com. Good for your heart, good for your brain, good for your mood! While just one part of the total B Complex, B12 is a vital one that our culture often lacks. Best sourced from grassfed meats, dairy and free ranged eggs, this water soluble vitamin is not only a key nutrient but also potentiates several other nutrients such as iron and Vitamin A, allowing your body to fully use and absorb all the nutrition it needs from these nutrients. While B-12 can be beneficial for a wide range of functions in the body, it does seem to be of significant benefit for your heart, brain, and energy levels! It seems to help prevent heart disease by lowering homocysteine levels, which are one of the key reasons that we see heart disease develop. It also helps generate healthy red blood cells, which in turn protects against anemia. Prolonged anemia can cause damage to the heart and other organs! Brain food could be another way to describe B-12! Studies have shown that adequate intake of B-12 can actually increase mental capacity. Regular intake of B-12 has also shown to help stabilize moods and decrease depression capacity. Elderly, especially those suffering from dementia, have been encouraged to take B-12 in conjunction with folate to help decrease the likelihood of their symptoms worsening. While it is unclear at this time if dementia is caused by a deficiency in B-12, the benefits from taking it are undeniable. While decreased energy alone is not necessarily indicative of deficiencies in B-12, it can often be the underlying cause or play a part in it. Nevertheless getting sufficient B-12 either through diet or supplementation can help restore energy levels and keep energy levels raised at a cellular level, primarily since it helps with DNA synthesis. Since it is water soluble, excess B-12 is shed in the urine and does not build up in the body. This is important because 1. If you intake too much, it will not harm you and 2. It is necessary to intake regularly through diet and/or supplementation because your body will not store excess for future use! The groups that are specifically at risk for B-12 deficiencies are the elderly, vegetarians, those with GI disorders or malabsorption problems, and pregnant or lactating women who either intake insufficient amounts of B-12 or are vegetarians. Note: To achieve maximum benefit, please hold in the mouth and allow to stay under the tongue for a minimum of 30 seconds. This allows the B-12 to be asborbed through the sublingual area. This product description is from Beeyoutiful.com. 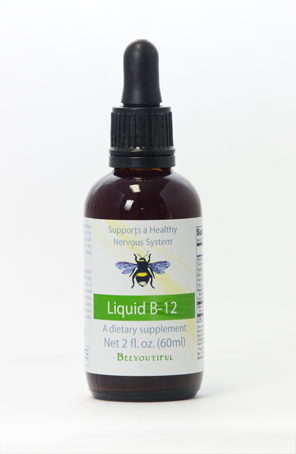 Click here to order Liquid B-12. Follow Smith Family Resources by email! This blog is no longer being updated. Please visit our new blog at www.smithfamilyresources.wordpress.com or our online store at www.smithfamilyresources.wordpress.com. WHO WE ARE: We are a family beginning to learn about natural health. We are excited about sharing our discoveries with you via this blog! WHO WE ARE NOT: We are not medical professionals. We are not even natural health experts. The suggestions made in this blog are suggestions, not prescriptions. The information that we share here has NOT been evaluated by the FDA and should NOT take the place of your own careful research and the advice of your health care providers. NEW BLOG: Visit us at www.smithfamilyresources.wordpress.com for more current posts.